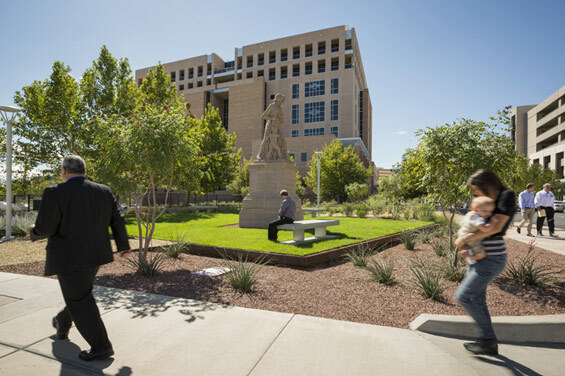 Rios Clementi Hale Studios’ environmentally friendly landscape design achieves GSA’s cost-saving sustainability goals in three interconnected ways: ecologically, economically, and culturally. In terms of ecology, the landscape design reintroduces native plants that require little supplemental irrigation, provides irrigation by collecting and re-using rainwater, filters stormwater runoff in on-site bioswales, decreases water usage by 85%, and replaces broad areas of unnecessary pavement with shade to help reduce heat island effect. Soon after its construction in 1998, the original design of the Pete V. Domenici U.S. Courthouse was met with controversy. To make room for the project, the Federal Government demolished an existing city park and shortly, the plaza planting and fountain were leaking into the parking garage below. From the generic landscape, the courthouse could have been located anywhere. 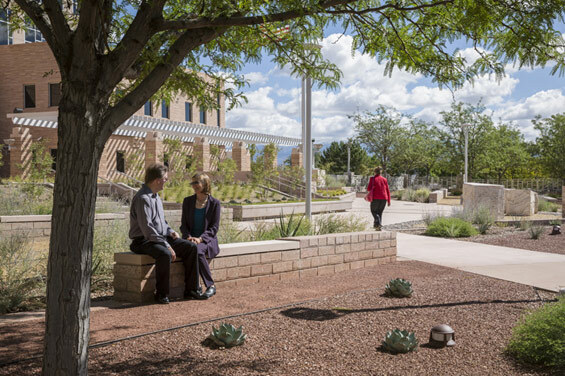 Moreover, in the high-desert climate of Albuquerque, NM, the large, hot plazas were completely empty throughout the day and the extensive lawn areas required more than 3.5 million gallons of potable water each year. 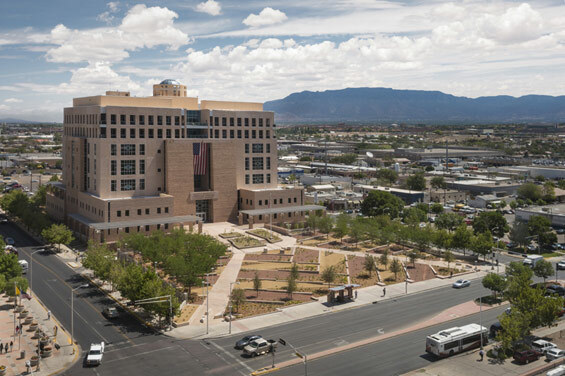 The courthouse site exemplified resource inefficiency, disconnection from environment, and distance from the public. 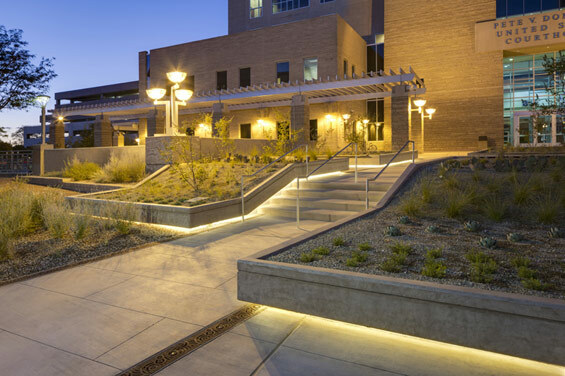 The U.S. General Services Administration (GSA) set a priority to become a more sustainable agency and find innovative solutions to efficiently and effectively maintain public buildings to reduce costs and save money for the American taxpayer. 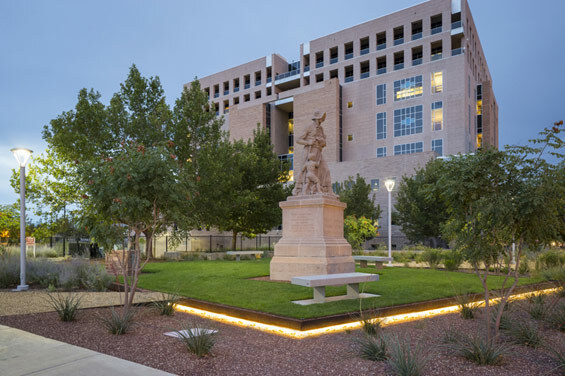 In 2010, the GSA’s Office of the Chief Architect contracted Los Angeles-based, multi-disciplinary design firm Rios Clementi Hale Studios to renovate the Pete V. Domenici U.S. Courthouse’s landscape as a model of sustainability by using innovative, cost-saving solutions. The site, spanning 3.3 acres, was one of a select group chosen to be a pilot project for the Sustainable Sites Initiative™ (SITES) rating system. The team proposed a design in which existing site elements and innovative technologies were re-imagined into a cohesive exemplary landscape rooted in the site’s rich ecological and cultural history. 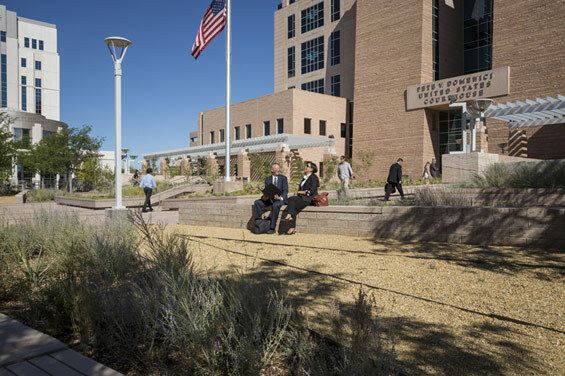 Visitors approach the main Courthouse’s entry by two long diagonal paths salvaged from the original design but now set within the terraced garden. More than 21,000 square feet of concrete paving was removed and used to construct the approximately 2,000 linear feet of recycled concrete garden walls and curbs. The walls direct rainwater into a series of terraced rain gardens that slope up to the building entry. 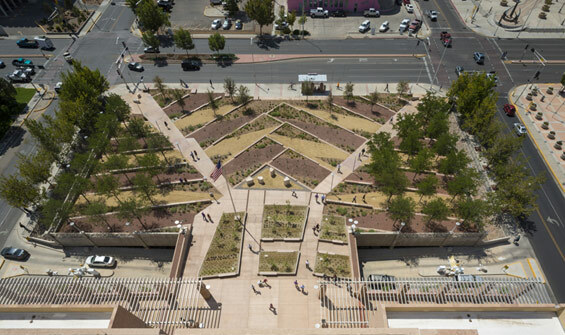 The three triangular rain gardens lead up to an entry plaza that bridges the front park to the courthouse doors, spanning secured entrances that lead to the garage below. 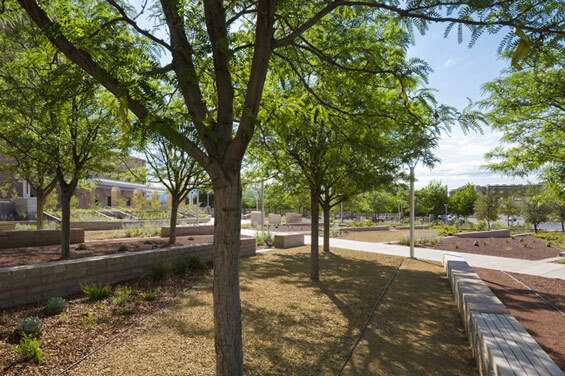 The landscaped rain garden terraces are at angles to the surrounding streetscape and are planted with two distinct groups of native plants: the most drought-tolerant plants at the upper edge and more water-tolerant ones at the lower portion of each terrace. Plum- and gold-colored decomposed granite make up the paved areas of the terraces. The four original travertine block sculptures, commissioned by GSA through local Native American artist Doug Hyde, were relocated to the plaza’s apex at the headwaters of the rain garden. 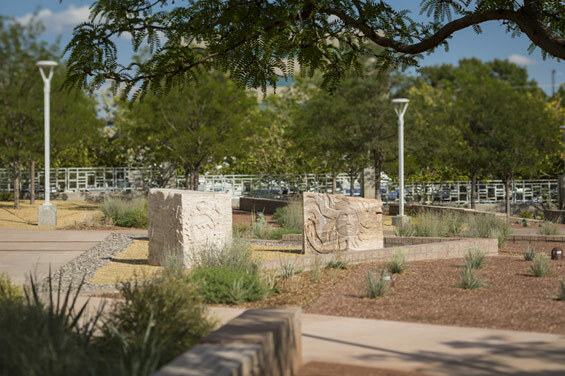 The central rain garden, which lines Lomas Boulevard, is divided into three distinct, yet related, garden types with corresponding plant species: Arroyo (Texas Live Oak, Mormon Tea, Sideoats Grama, Yellow Bird of Paradise, Damianita Daisy, Green Sotol, Blackfoot Daisy, Threadleaf Coreopsis), Mesa (Apache Plume, Trailing Indigo Bush, Fringed Wormwood, Russian Sage), and High Desert (Agave Parryi, Yucca Elata, Yucca Baccata). On the east and west sides of the central garden are mirror-image shade chaparral gardens with existing Honey Locust Trees, along with Yellow Bird of Paradise, Autumn Sage, Sunset Hyssop, and Pineleaf Penstemon. The stepped paths gradually elevate to meet the front entry garden, which itself sits upon a base fronted by steps. Large shallow planters that follow the elevation of the steps are planted with Chaste Tree, Fringed Wormwood, Agave Parryi, Beavertail Cactus, Blue Oat Grass, Pink Muhly, and Pineleaf Penstemon. Slightly raised above ornamental drain grilles, the floating planters are under-lit for a dramatic evening effect. The grilles derive their decorative motif from the concentric patterning of a rain drop splashing into water. Their placement throughout the landscape makes evident the actual stormwater flow pattern throughout the site. The rear parking lot features bioswales planted with Goldenrain Tree, Pink Muhly, Sideoats Grama, Blue Fescue, Green Sotol, and Fringed Wormwood. Historic McClellan Park is remembered in the newly created Madonna of the Trail Park, featuring the historic statue of the same name. This pocket park sits at the northwest corner of the site, and includes a floating plinth containing the one remaining piece of lawn upon which the statue and benches sit. Like the platforms in front of the building, this plinth is also lit from beneath. Several species from the front gardens, along with additional specimens, comprise the plant palette: Goldenrain Tree, Yellow Bird of Paradise, Fringed Wormwood, Russian Sage, Mormon Tea, Sideoats Grama, Yellow Bird of Paradise, Damianita Daisy, Green Sotol, Blackfoot Daisy, Threadleaf Coreopsis, and Pink Muhly. 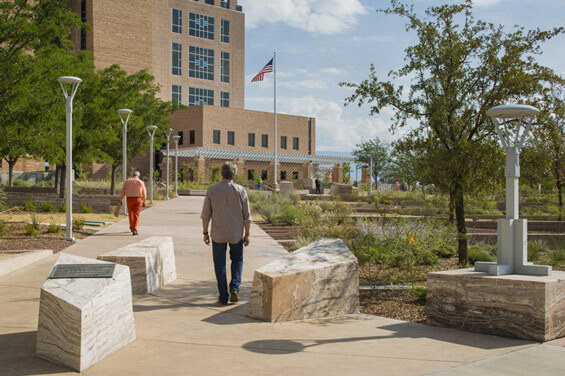 Economically, the landscape design cuts energy costs by using solar panels installed atop pre-existing surfaces, reuses existing concrete by strategically integrating it into the on-site design, and reduces the need for landscape maintenance. The cultural impact offers a working example of a sustainable landscape, reestablishes a downtown park-like environment for the community, and promotes sustainability awareness and education to the public. Lighting | Kaplan Gehring McCarroll Architectural Lighting, Inc.
Irrigation Designer | Surroundings Inc.